Last weekend the long-awaited Wake Heroes 2018 contest was held. It was long-awaited considering the fact that we’d received invitations in March! 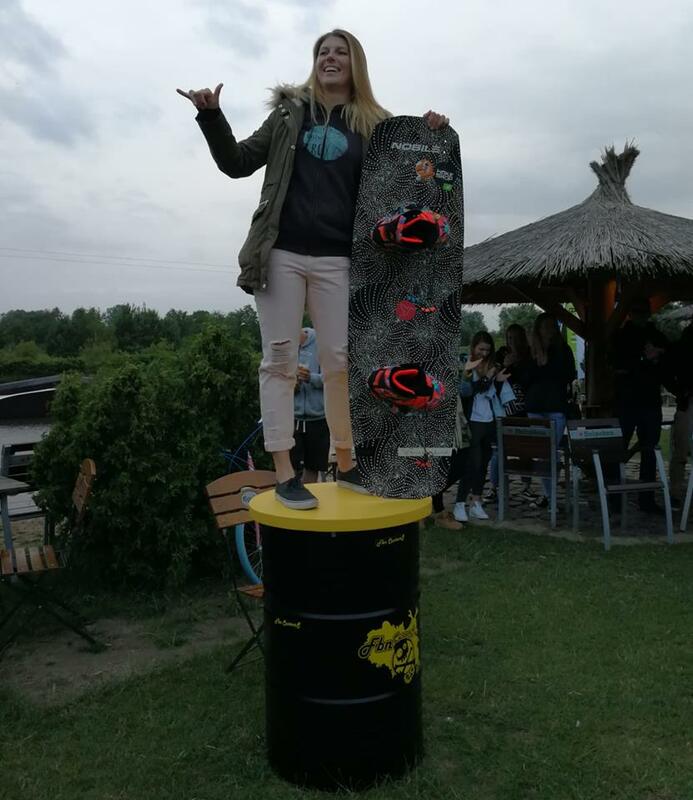 Eight girls, sixteen boys and eight wakeskaters were invited to Łejkówka in Nowe Miasto on Pilica to fight for “Wake Hero” title. The extra splendour was added by the organizer who invited participants at his own expense, providing accommodation and food which seems to be a new quality in Poland! To make matters worse, after two months of “summer” this weekend we were welcomed by 15° Celsius and a rain. Fortunately, it didn’t spoil our fun, as it was the first contest this season and we hadn’t seen each other for ages. In addition, we had a tub full of water hot as in sauna at our disposal, where we could warm ourselves up between the runs. The obstacles setup was impressive too – the Primus guys prepared a nice surprise for us: the “loszka” (“wild sow”) which was the transfer with pipe and rainbow, built especially for this contest. 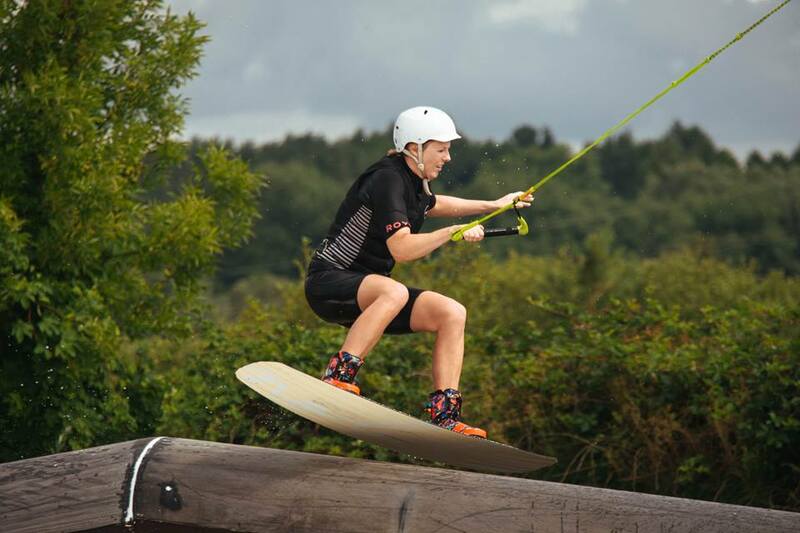 The event was attended by the whole crème de la crème of Polish wake, including all medallists of men’s and women’s open Polish Championships, as well as few foreign wakeskaters who live in Poland on a daily basis. The women’s competition included my best wake friends, which was fun as we could ride together, and terrible at the same time to eliminate each other. As a result of drawing I came across the unknown rider – Ewa. I didn’t know how she performed, fortunately the tricks I challenged her with turned out to be effective and she quickly completed the “WAKE” word. In next, semi-final round I encountered Agnieszka Derlatka – my friend and daily co-rider. It wasn’t an easy challenge, as we learn similar tricks riding together. Fortunately I managed to win and so I got to the final with another of my good friends – Marta Daniło. At first glance the challenge may have looked easy, but everyone who is familiar with Marta knows that she’s a real fighter, doesn’t give up and what’s even worse – she’s not afraid of anything. So I challenged her with 360 backside, switch 540 frontside and toeside frontside 540. After collecting three letters and being close to drop out, Marta paid me back with tricks she knew I would fail to complete, including tantrum I couldn’t ride around lately (I shouldn’t admit I can’t do such elementary trick). Fortunately, I regained lost points by completing switch transfer Marta challenged me with and the transfer with 180 backside I chose myself. And that’s how I won among women. Our final challenge was fierce and very exciting, as well as motivating for my opponent who tried (and succeeded) toeside frontside 540 I made her for the first time! I was very proud of my friend who took up every challenge I threw at her and didn’t give up the win easily! Among wakeskaters the contest was won by Nikita Gapko from Ukraine, well known to Wake Family Brwinów regulars. It’s worth to mention that Nikita participated in wakeboard competition as well but was eliminated by Dawid Balas. The final challenge in wakeskate was played between Nikita and Alexis Duverger from France (also riding in Brwinów on a daily basis), and it was Nikita who finally won. I’m very happy I had a chance to take part in the Wake Heroes 2018 event. And I’m satisfied with my win, definitely thanks to the best board in the world – Nobile Whirly Bird Wmn!